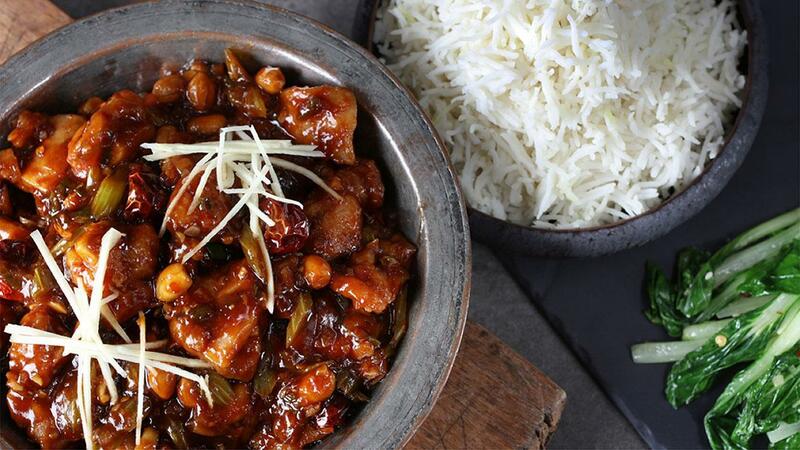 Kung Pao Chicken is a Chinese stir-fried dish with chicken cubes, dried chilli pepper and deep-fried peanuts. The taste of the tender chicken matches great with the crispy peanuts. Everything is cooked in a spicy sauce, with a dash of sweet & sour. See the full recipe below! Whisk all the ingredients together and keep until stir-frying the chicken. Marinate the chicken in Knorr Chicken Stock Powder and a little oil for 6 hours. Heat the Rafhan Corn Oil in wok, this will be used for deep frying the chicken pieces. Drop the chicken pieces into Knorr Batter Mix – just the dry powder, no need to mix it with water. We simply want to dust the chicken for frying. Deep fry the chicken pieces until crispy and golden. Dissolve Knorr Chicken Stock Cube in water and add to the rice. Cook and steam rice for about 15 minutes. In a wok stir-fry the onions and celery for a minute, then add the chilli’s, ginger and garlic. Add the chicken and toss as you cook. Add the sauce and combine all the stir-fry ingredients. Before serving mix in peanuts and spring onion. Garnish with julienne ginger and coriander.